Finally, someone has made a Track Saw the right way, and by "right", I actually mean left. What I actually mean is that Kreg has come out with a new Track Saw System and they have gone against the norm by using a blade-left design—something I have been complaining about for years. 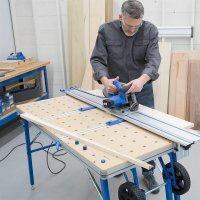 The new Kreg Track Saw is more than just the saw though; the saw is only part of Kreg's Adaptive Cutting System, designed to replace a table saw and even a miter saw for certain tasks.